What do you get when you cross a Samsung mirrorless interchangeable lens camera with the Android 4.2 operating system? Why, a Samsung Galaxy NX. Of course. In a global announcement from Samsung on Thursday, the company let loose information about its new 20.3-megapixel shooter, which sports 3G and 4G LTE and Wi-Fi connectivity. 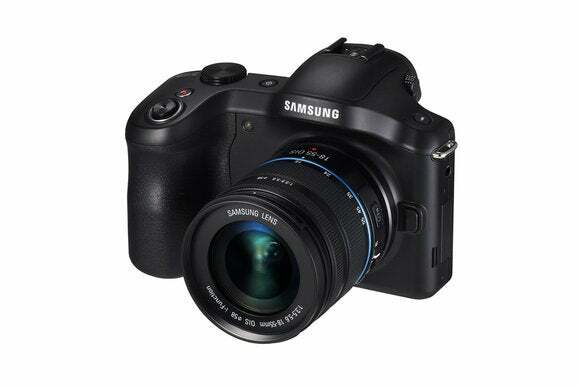 Samsung already has a Galaxy point-and-shoot camera with an Android OS, long-zoom, and cellular wireless capability, so the Galaxy NX is a step up for photographers who seek more range, capability, and better image quality. The unit is fairly light at a little over a pound, but relatively bulky, with dimensions of 5.39 by 3.98 by 1.02 inches. Shooting in both JPEG and raw formats, with an ISO range of 100 to 25600, the Galaxy NX captures a variety of video and audio formats, from MP4 to AVI, and MP3 to AAC. It has a built-in, pop-up flash on a system with 16GB of internal memory and 2GB of RAM, and the microSD slot supports cards up to 64GB. While this device may look like a camera from the front, from the back, it has all the paw prints of an Android smartphone, from its huge, 4.8-inch (921K) capacitive touchscreen LCD to its 3G and 4G LTE and Wi-Fi connectivity for sharing images with friends and family, or posting to social networks. The camera, powered by a DRIMe IV Image Signal Processer, promises speedy performance. The 20.3MP APS-C CMOS sensor—the same as the company's NX300—offers image quality on the level of larger sensor DSLRs and DSLTs. The camera also features an Advanced Hybrid Auto Focus (AF) System for accurate phase and contrast detection on an 18-55mm F3.5-5.6 kit lens, while the 1/6000 second shutter speed and 8.6 frames-per-second shooting lets you capture action shots. The real kicker is that all this works with Samsung's slate of interchangeable lenses. From compact pancake lenses, ultra-wide fisheyes, to longer prime and zoom lenses, all scenes can be viewed with the camera's SVGA electronic viewfinder. True 3D Creator lets users shoot stills and video in 3D with Samsung's 45mm 2D/3D lens. Samsung's Galaxy NX works with a wide variety of lenses. Because the camera operates on the Android OS, powered by a 1.6GHz quad-core processor, shooters can take advantage of the entire inventory of apps available for Samsung's smartphones. The Galaxy NX can also transfer your pictures to smartphones and tablets. More than 30 Smart Modes let you get creative. Multi Exposure, for example, merges two shots into one image. Animated Photo connects continuous shots of up to five seconds, creating an animated GIF file—an old form that has come back into vogue with a vengeance. Sound & Shot mode stores sound and voice together as the picture is taken. Working with the built-in GPS, the Photo Suggest feature detects your current location and consults a database of photos to suggest photographic opportunities for you. So the question remains, when can people get their hands on this thing? Not so fast. Pricing and availability have yet to be announced.